So when I said yesterday that "The Cap'n has a long and storied history with the Resident Evil franchise," I neglected to mention that none of it made the transition from old Blogorium to new Blogorium. Back in the days before twittering, the Cap'n was delivering bite-sized reviews ("fun" sized?) and when the time came to pick and choose what I thought people might want to read in the "official" Blogorium archives, 98% of all things related to Resident Evil didn't make the cut. I saw Resident Evil with two friends who, along with others, made up a consortium of movie-going hooligans known to terrorize otherwise sensible adults. They would pay good money to see Jeepers Creepers, 8mm, and Dungeons and Dragons, and we would descent like a pack of MST3k-aping hyenas, callously commenting on everything in the film. Think of us as the dinner theater equivalent of a Mr. Plinkett review and you have some idea why the ushers had to come down and yell at us. Seeing Resident Evil only made sense, because we played the games and the movie looked stupid and at that point in time WE SAW EVERYTHING. WE SAW IDLE HANDS AND AMERICAN PIE 2 AND THE IN CROWD, for crying out loud. There wasn't a movie so unwatchable (Loser) that we couldn't find an excuse to go see. Resident Evil at least had the pretense of kind of being related to something we liked. I tried to watch Resident Evil again on DVD with another friend of mine who hadn't seen the films but liked the games, and he fell asleep. I did not, and I feel like he got the better end of the deal in that situation. Now here's the funny part: I would imagine you think I hate all of the Resident Evil movies, but the truth is that I kind of like Apocalypse and (to a lesser degree) Extinction. What they have in common is that Paul W.S. Anderson didn't direct them, probably because he was off ruining Alien vs Predator and something else that wasn't Death Race*. He produced them and was involved in writing them, but in the hands of someone not named Paul W.S. Anderson, the first two sequels were kind of dumb, but had a kinetic energy to them, a vague sense of scale (especially in the third film), and action sequences that didn't make me want to fall asleep. 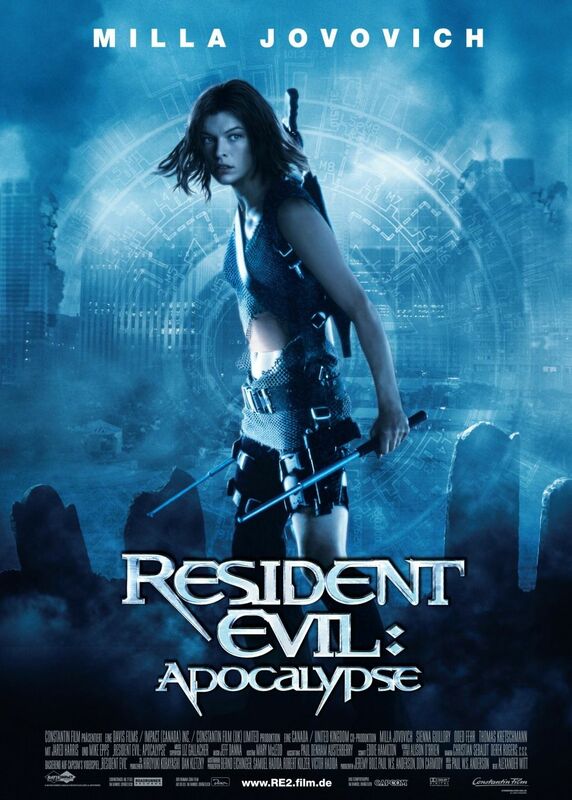 The following link takes you to a review of Resident Evil: Apocalypse by our own Professor Murder, which features what may be my favorite SPOILER ALERT ever. Resident Evil: Extinction - Here's the best instance of "yeah, like I was going to watch that", so I did it for you. What can I say? It's trying really hard to further the Resident Evil story from the first two movies, while trying to be scary and action packed. Well, it's not really scary. There's not a lot of action. What there is amounts to lots of shots of crowds of zombies, tons of people dying, and Milla Jovovich shooting and slashing anything that moves. RE:E has a decent sequence that reintroduces Jovovich as Alice, both as a cloned experiment and as the real deal, and it seems like the movie might be building to a really cool action sequence in what's left of Las Vegas. Then it abandons pretty much all of that in favor of a REALLY rushed "stalk the monster" sequence which makes up the last 3% of the movie. It's like someone said "we need to get this over with" when the movie's barely 90 minutes long, and it feels like a reel is missing or something. Still, I guess if you liked Resident Evil: Apocalypse, you might want to rent this. 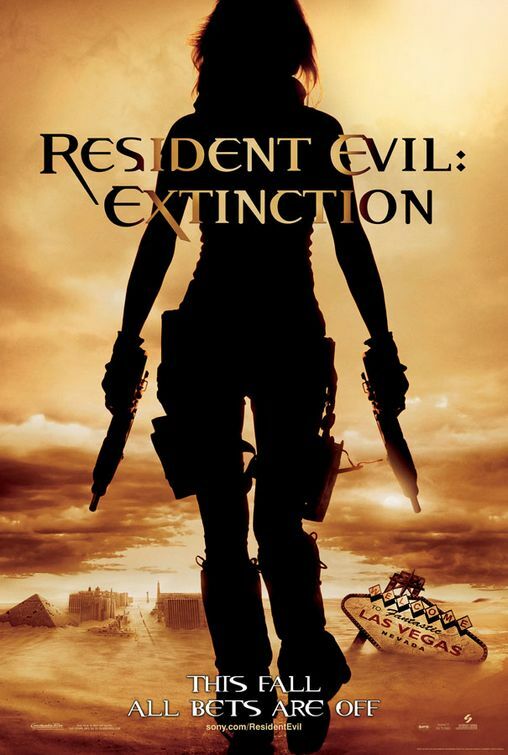 Resident Evil: Extinction - I'm on the record not liking Resident Evil. I think Resident Evil: Apocalypse was a dumb antidote to the "trying to be smart" first film. Resident Evil: Extinction has some good ideas that don't really get the attention they should. It doesn't help that the film feels like it's missing a reel near the end. And that's about it. I'm actually surprised that I remember the film at all, because it only really comes to me in fits and bursts. The kid named after a store, Mike Epps being eating by zombie crows, Milla Jovovich falling into some kind of trap with zombies, and the introduction of the Alice clones that Afterlife promptly did away with in its prologue. Wesker is in there somewhere, and I think Claire (Ali Larter) but don't hold me to that. I'm not invested enough to go back and be sure. Foggy memories seem to function best as it pertains to Resident Evil films. Now you have a better idea of my "long and storied history" with Resident Evil, and perhaps that give some context to why I think the fourth and fifth movies are gigantic turd sandwiches you don't need to see. Ever. * I'm not kidding or being sarcastic about Death Race. I actually think it's the one good movie he's ever made, one that openly embraces its schlocky nature and is actually fun to watch. It is the antithesis of the type of movies Paul W.S. Anderson usually makes. Labels: Bad Ideas, Drunken Screenwriting, Guest Blogger, Milla Jovovich, Not Zombies, Paul W.S. Anderson, Retro Review, Spoiler, Unnecessary Sequels, Video Game Movies, What the Hell was that?